*These stories are continued from TMNT New Animated Adventures #15. 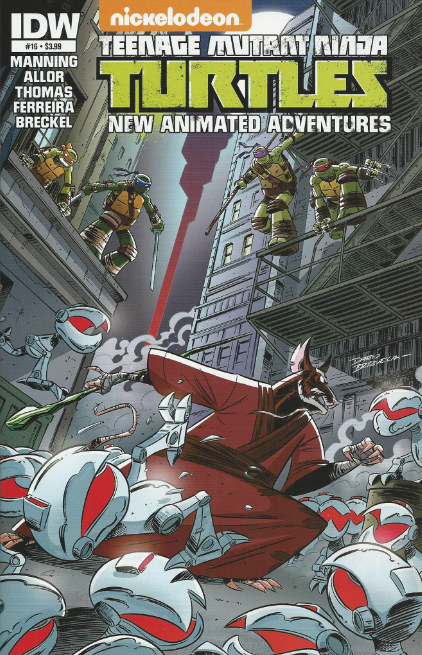 The stories continue in TMNT New Animated Adventures #17. *Beginning with this issue, the cover now features "Nickelodeon" branding as part of the title (though the indicia still reads "Teenage Mutant Ninja Turtles New Animated Adventures", indicating the actual title has not changed). *This issue was originally published with 2 variant covers: Regular Cover by Dario Brizuela, and Cover RI by Dave Alvarez. wasnt the title long enough to begin with with out nickelodeon ? are they going for a shot at longest most convoluted comic title ever ?